No matter the size or structure of your team or the extent of your website redesign, this undertaking is no small feat. It involves many steps and many players, including those behind the creation and migration of content. So before the redesign takes off, be sure you’re prepared for a seamless content transition. As a team, the most crucial step is the first one: Ask yourselves why you are redesigning your website. Is it to modernize the look and feel of the site? Did you recently go through a rebranding? Do your analytics show that certain things just aren’t working? Do you need to develop an accessible website? Identifying a clear mission will help guide your content in more ways than you may realize. A new design likely brings new content. Analyze your content audit and determine where there are holes. Do you need to cover a certain topic more? Do you need to incorporate more videos and images into your posts? Do you need to revamp your About Me page? Take note of these things to help make your new and improved website as well-rounded as possible. Then the next question is, what do you do with old content? Sift through existing content to determine whether or not it still applies to your website redesign mission and company core values. This could help shed a lot of content weight going forward. Similar to a table of contents in a book, a sitemap outlines where and in what order your content will reside. It can be an effective planning tool for both content creators and designers. This centralized document can help organize and clarify the content on your site to best suit your visitors’ journey throughout the website. While sitemaps are made for visitors, they also allow search engine crawlers to find the pages of your site with ease, so keep SEO in mind. After all, search engines want to provide the best user experience for visitors, too. Last, but certainly not least, a website style guide will save your team countless edits and headaches. While things like uniform capitalization and oxford commas may seem minute, consistency builds credibility with your visitors. A style guide will influence the design, layout, interactive, and type elements used throughout the website, so be sure to carve out proper time to make it shine. By tackling these content to-do’s, you and your team can breathe easy knowing you’re a few steps closer to a focused, well-rounded, consistent—not to mention revamped—website. 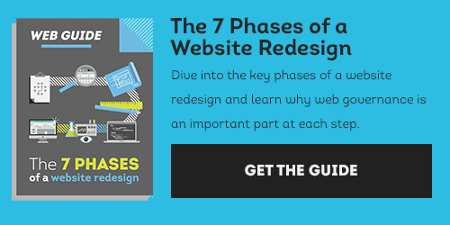 For more guidance on the entire website redesign process, check out our web guide, 7 Phases of a Website Redesign.